I took my mom to Starbucks once… it didn’t go well. We spent the morning shopping and by the afternoon, she was craving chai. I had two choices: go home so my mom could make her own chai OR convince mom to go to Starbucks so we could keep shopping. I (wrongly) chose the second option. We stood in line and I ordered my mom a “chai” with milk. After taking literally one sip, my mom handed me the tea and said she couldn’t drink it. So. That said, forget about ordering a chai latte at Starbucks. It will never taste as good as what you can make in your kitchen in just a matter of minutes. 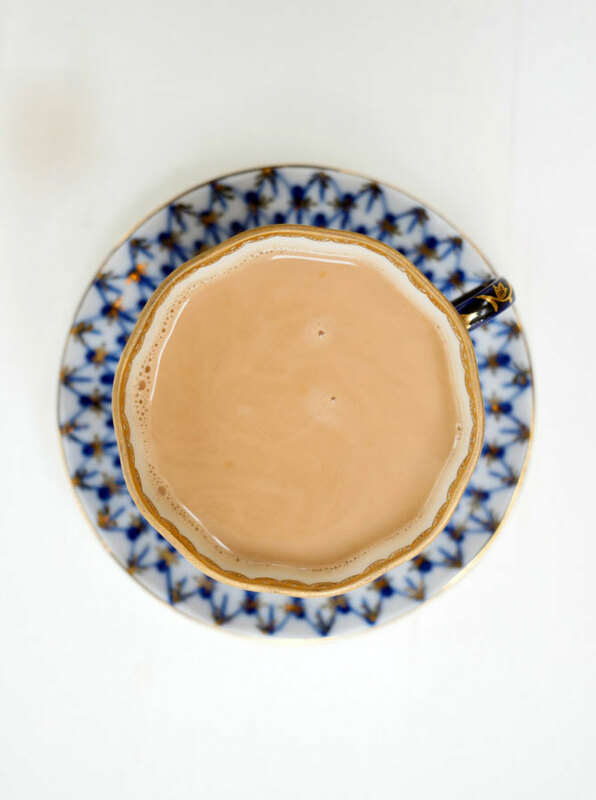 To make authentic masala chai, all you need is some black tea, a few spices and your choice of milk. I grew up watching my parents drink chai, two times a day – morning and afternoon. I’m Punjabi, so we actually call it “cha” and not chai, but same difference. Both words mean tea. Whenever we visit India, it seems like people are forever drinking cha. It’s so good. I love drinking a cup of tea while snacking on mathis (savory Indian biscuits). 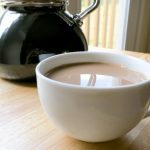 Regular cha is soo easy to make. After making it just once, you’ll probably wonder why you ever spent $5 on a chai latte. 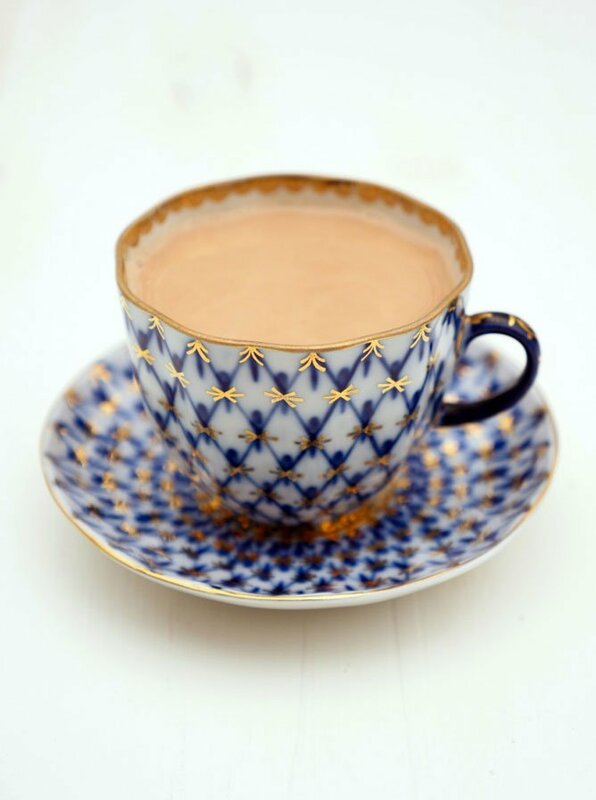 There are three spices that you’ll need for masala chai: cardamom, cloves, fennel seeds. Add these spices along with 1 cup of water to a teapot. Bring the water to a low boil and then add your black tea. When the color of the water changes to a nice deep brown, add your milk. Bring everything to a boil and then turn off heat, put the cover back on the teapot and then strain your chai and serve. Make sure you carefully watch your pot while boiling the tea to make sure the milk doesn’t boil over. For my recipe, I use black tea bags, but you can certainly use loose black tea if you’d like. I think most people probably have easier access to the bags, which is why I’m using them here. As for the milk, I use almond milk (here’s my homemade almond milk recipe) or cashew milk. If you prefer whole milk, use that – just see my notes. Add cardamom, cloves, fennel seeds and water to teapot – bring to a low boil. Add tea bags to water and cover for 2 minutes. Remove cover and once the color of the water changes to your liking, add almond milk. Bring everything to a full boil, then turn off the heat (be sure to carefully watch the pot so the tea doesn’t boil over!). Put your cover back on the pot, strain your chai and serve. If you want a ginger (or cinnamon) masala tea, add an extra ¼ c water and ½ inch knob of grated ginger (or cinnamon stick) – and boil the spices longer for a stronger flavor. If you are using whole milk, then use 1 ½ c water and ½ c whole milk instead of the proportions listed above. What is the nutritional info for a serving? Can you refrigerate it? Hi Penny, the nutritional info will depend on what type of dairy and sweetener you decide to use. The fat/calories will only come from the milk and sweetener. As for refrigeration, you can certainly do this, however, most Indian families serve this hot chai immediately after making it. I think a fresh cup will always taste better 🙂 If you’re looking to make a single serving, just halve the recipe – that’s what I do! Thank you for sharing something from your family, I will be happy to enjoy your familiar flavors. Hi Gretchen! Thank you for letting me know 🙂 And, I hope you enjoy this chai. How long will this last if I make a big batch of it? Hi Jen! Like coffee, this hot chai is best served immediately after making it. We are so used to making this that it doesn’t seem like much to make it daily. I’m honestly not sure how long it’ll last if you make a big batch and keep it in the fridge. If you try this, please report back! I loved this Chai Masala recipe, and I have included it on my website’s facebook page as a recommendation! It works perfect for my Spice Series, which focuses on the medicinal and culinary benefits of some of these spices for our diet. Thanks for the recipe! This sounds delicious! Wondering why you recommend skim milk for non-paleo people?! What about all those gorgeous fats in raw whole milk? And skim milk has added milk powder to it to make it thicker…as well as homogenized– both possibly connected to heart disease. I might consider recommending that to your viewers :o) That’s my too sense if you are interested!! Beautiful blog by the way! Wondering how much ground cardamom you would use? Thanks for this recipe. I’m not a fan of almond milk and wondering what you think about substituting hemp milk? Also, I see Cardamom pods in a lot of your recipes but when I shop the spice section I can ol find the ground. Should I be looking somewere else for the pods? Just tried it with homemade hemp milk. It was good, but I could definitely taste the hemp. I just made this with coconut milk. Awesome! I love chai tea. Do you use green or black cardamom pods? Hi Debbie – definitely the green cardamom pods. I have a link to the brand that I use – you can find it by clicking on the ingredients. Enjoy! Your recipes are amazing, Ashley! As a Punjabi (Canadian) person, I am so into your recipes. For this masala cha (! ), if I wanted to make more of it, do you think doubling all the ingredients is a good way to go? Thanks! I was trying to find a good recipe that uses almond milk over dairy milk, and I wanted an Indian person’s recipe since my mom and I haven’t perfected it yet. 🙂 I enjoyed it, but I do think I needed more sugar than I would put if it was dairy milk. Do you have this issue? Does this taste similar to cow’s milk? Been experimenting with non-dairy milk. So far, I can taste the milk even in masala chai. This recipe is so good. I’ve been drinking it everyday now for almost a week. Thank you! Lynn, I’m so happy to hear that! Thanks for letting me know how much you like the chai!